First, let me make something clear. My wife, Denise, is the cook in the family. Before I met her, if I wanted to eat, I cooked it myself. Since we’ve been together, I realize that I’m not as good as she is, so I’ve confined myself mostly to the grill. However, back in the day, I could rustle up a few things. One is my chicken cacciatore, which is actually an Italian hunter’s stew. My family usually ate it with rabbit, but it is also great with chicken. The “hunt” takes place in the local grocery store for chicken. My introduction to non-frozen, haute cuisine came about back when my older kids were little and I was stuck at home watching them for the day. Yeah, I could make hamburgers on the grill, but I aspired to something better. There was a largely unused copy of “The Joy of Cooking” on a shelf in the kitchen, so I decided to peruse it. Almost everything had way more ingredients than were to be found in my farmhouse pantry, until I got to page 86, “Chicken Cacciatore”. Now, I’m about half Italian, so the call to try this was strong. Also, I had mostly all the stuff the recipe was calling for, so I decided to give it a go. I didn’t have pasta, so I made rice to go with it. My famously finicky kids didn’t turn up their noses, and a new family favorite was born. When I met Denise, she quickly took full charge of the kitchen, and my caccetore recipe was lost to time. Until recently. Funny thing. Cooking is like riding a bike. It came out to be just as good as when I made it way back when. Even my current finicky kid, Max, woofed it down. So here is my take on a classic fall dish. I hope you like it. Prep time is about 15 minutes. Finely dice the onions, and finely chop the parsley. Thin slice the mushrooms. The recipe calls for a large 28 oz can of crushed tomatoes, but I open a second can and add some if it looks too thin and the pan can accommodate it. You’ll want to use your largest skillet, preferably with vertical sides. Brown the chicken in olive oil in your large, shallow pan, then add the onions. The chicken should cover the bottom of the pan, and should take up about one-half the depth of the pan to have room for the sauce. Saute the onions in the chicken for a few minutes turning the chicken over a couple of times to make sure it is nicely browned. Then splash in the wine. You really can’t use too much wine. Add in the crushed tomatoes, tomato paste and mushrooms. Let the whole thing cook down for 45 minutes. Taste the sauce from time to time and salt to taste. Mix the chopped parsley with garlic powder and lemon juice. Yum! You’re Ready to Eat! Spoon some rice on a plate, then the chicken and sauce. Top with the garnish. The recipe makes more than you and your family can eat, and that’s just as well as this tastes great the next day, too. Save any sauce you have left as it makes a great spaghetti sauce. Brown the chicken in olive oil in your large, shallow pan, then add the onions. Saute the onions in the chicken for a few minutes turning the chicken over a couple of times to make sure it is nicely browned. Then splash in the wine. You really can't use too much wine. Serve with rice or pasta and garnish with the parsley mixture. Yum. Funny that you and I both made it again in the same week. Now, how about Pap Pap gets both of my finicky kids to try a mushroom. Especially my big kid, Jay. Love you! This stuff tastes better the next day. I swear. If you cut the mushrooms thin enough, you can hardly tell they’re there. That looks so good!! The sauce looks rich and creamy – I can almost taste it! Thanks for sharing at the What’s for Dinner Party! Thanks Helen. Really like this on a cold winter day. Thanks Angie. You’ll love it. The recipe calls for “2 teaspoons garlic powder, separated”. When the ingredient is used in the recipe, neither time does it say how much is used. 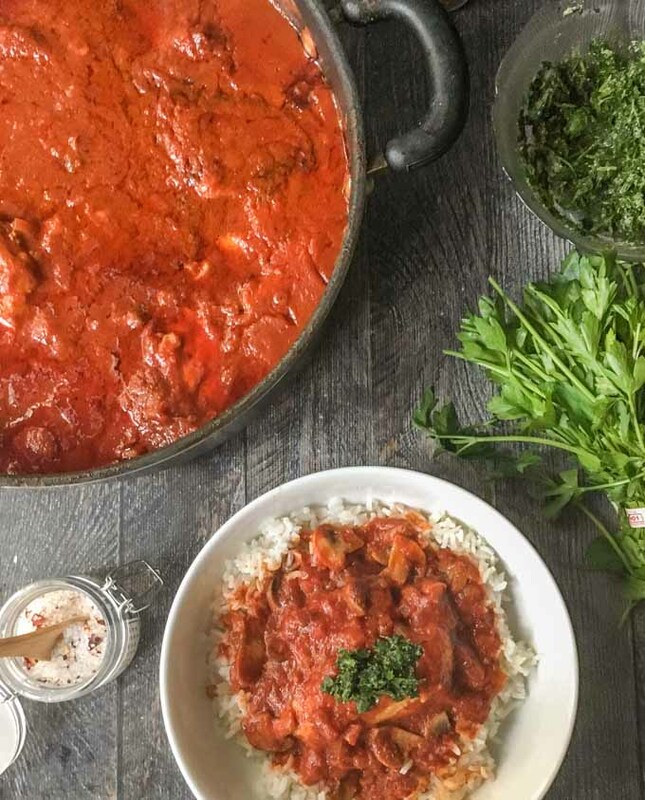 Are you using one teaspoon each time — one when making the sauce and one with the parsley? Sorry for the confusion Jen. I put a teaspoon in the chicken and a teaspoon in the garnish. 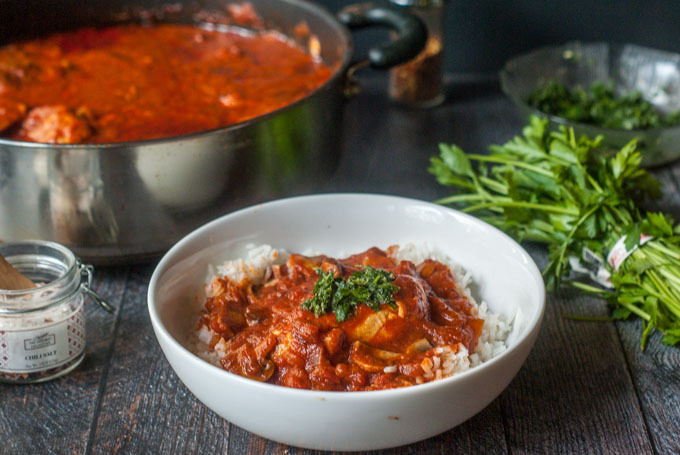 Your Chicken Cacciatore looks delicious! Your post is awesome and thanks so much for sharing it with us at Full Plate Thursday. Hope you have a great week and come back to see us real soon! A family favorite in our home. This looks really good. Thanks for sharing at the Inspiration Spotlight party. Pinned & sharing.